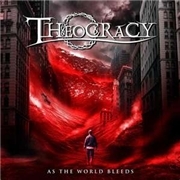 US heavy metal band THEOCRACY goes against the grain. They use choruses, epic arrangements and progressive elements to an extent that is not American. Since their self titled debut in 2003 they´ve done some live work, in the US and in Europe, plus released a follow-up, the acclaimed “Mirror of Souls”. This is the difficult third album, and to start on the right foot they hired Mika Jussila (STRATOVARIUS, NIGHTWISH) for mixing, and Felipe Machado Franco (BLIND GUARDIAN, ICED EARTH) for the cover artwork.